Earthworms are primarily a terrestrial and freshwater group, sensitive to changes in the quality of their habitat. But there are some earthworm species that are tolerant of more saline environments. 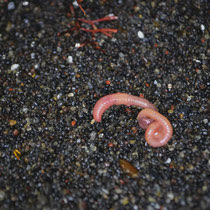 One such species is Pontodrilus litoralis, a widespread earthworm found in warm coastal habitats around the world, being recorded from such far-flung places as the Caribbean, the Mediterranean, Australia and Japan. The species is found in sandy or muddy soils in coastal habitats, including beaches, estuaries and around the roots of mangroves, and is able to tolerate salinities from 5 to 25 parts per thousand—that is, from fresh water to close to the standard salinity of sea water (Blakemore 2007). Pontodrilus litoralis in its natural habitat, from here. Pontodrilus litoralis is one of five species currently recognised in the genus Pontodrilus, though many more have been recognised in the past (Blakemore, 2007, listed eighteen species and subspecies now regarded as synonyms of P. litoralis). Characteristic features of the genus include an absence of nephridia in the anterior segments, and tubular prostrate organs opening to male pores on the eighteenth segment. The other Pontodrilus species have more restricted, non-coastal ranges; one, P. lacustris, is found free-swimming in Lake Wakatipu in New Zealand, whereas the other three are found in terrestrial habitats in Sri Lanka, China and Tasmania. How P. litoralis achieved its wide distribution is currently unknown. If it arose prior to the separation of the land-masses on which it is now found then it would have had to have survived almost unchanged for hundreds of millions of years, which seems on the face of it unlikely. It seems more credible that it has dispersed more recently from its original point of origin, but while its green, spindle-shaped cocoons are often found attached to floating vegetation we do not know how long they can stand immersion in full-strength salt water. Nor do we know just where P. litoralis originated. It was first described in 1855 from the French Riviera so many authors have assumed the species is Mediterranean in origin. However, the distribution of related species seems to make an Indo-Pacific origin more likely. It may well be that P. litoralis was spread from its original home by humans, carried with rocks and sand used for ballast. Blakemore, R. J. 2007. Origin and means of dispersal of cosmopolitans Pontodrilus litoralis (Oligochaeta: Megascolecidae). European Journal of Soil Biology 43: S3—S8.